When I explain to people that I meet everyday that I am involved with the study of space safety, the first response they make is: “Just what is space safety?” The problem is that everyone, even within the field of space safety, has their own definition. Some people think of astronaut safety. Others think about the design of safer launchers, spacecraft or satellites. Others in field of satellite telecommunications think about possible conjunction of spacecraft or space debris hazards. Yet others think about nuclear materials and toxic materials such as hypergolic fuels used in space missions which might expose people to risk. Recently, space traffic management and space situational awareness have been hot topics. Just a very few think about Near Earth Objects (NEOs), Potentially Hazardous Asteroids (PHAs) and other dangers from space such as cosmic radiation or coronal mass ejections (CMEs). The International Space Safety Foundation (ISSF) and the International Association for the Advancement of Space Safety (IAASS) are concerned with “all of above.” We are truly concerned about these safety issues and risks and even more. The following series of 3 editorials seeks to raise awareness about physical hazards from space that are remote in terms of likelihood but potentially devastating in scope. The first of these editorials is about assessing the nature and degree of risk. The second editorial is about a realistic assessment of the nature of the risk in coming decades—thus we are thus particularly looking at potential hazards that may affect the lives of people currently on Earth through the lives of our grandchildren. The third editorial is about what could or should be done about those risks to mitigate them once discovered. So what should we do to assess just how big a risk is posed by Near Earth Objects? How can the general public start to grasp even what we are talking about? Apollo 8 Astronaut Rusty Schweickart, who for years headed the B16 Foundation, is a brilliant spokesperson on this subject, but people he has reached have generally been space scientists and perhaps a few sci-fi zealots. How can we reach a wider audience and give them a realistic view of the dangers within a scientifically accurate framework. One possible answer is the so-called Torino Scale. At Unispace III in Torino, Italy, the assemblage agreed to adopt the Torino Scale that combined an assessment of “likelihood” with the size, kinetic force and likely degree of devastation that a wayward meteorite of varying sizes could create if it impacted our planet. Almost everyone in the world understands what the Richter Scale is and its progressive levels of impact as measured on a logarithmic scale from 1 to 10. Likewise we understand categories of hurricanes from 1 to 5. The Torino Scale for Potentially Hazardous Asteroids—also on a scale of 1 to 10—can help the general public understand that it is especially Category 8 to 10 Near Earth Asteroids that are important for us to avoid if we possibly can. We need to involve the United Nations, the general press, and major news web sites to get out the word on the Torino Scale. This general understanding of the Torino scale can help us build consensus to invest in two important things. One would better means of space situational awareness. These enhances system would go well beyond the capabilities of NASA’s Wide Field Infra-Red Survey Explorer (WISE ) in order to provide a comprehensive and much understanding of the 20,000 to 45,000 asteroids out there could impact Earth in very unwelcome ways in coming decades, centuries or even millennia. The other investment would be to create improved systems to actual address the threat of “killer asteroids.” There have been efforts first advocated by Arthur C. Clarke that turned into NASA’s Earth Guard as well as the European Commission’s latest effort known as “NEOShield.” These programs are aimed at developing tools to deal with an asteroid that is found to be on a collision path with our planet. At this stage these are programs with extremely modest funds and with no real sense of urgency. If we discovery we have a potential scale threat that is a Number 9 or 10 on the Torino Scale and it is too late—then it will indeed be TOO LATE. 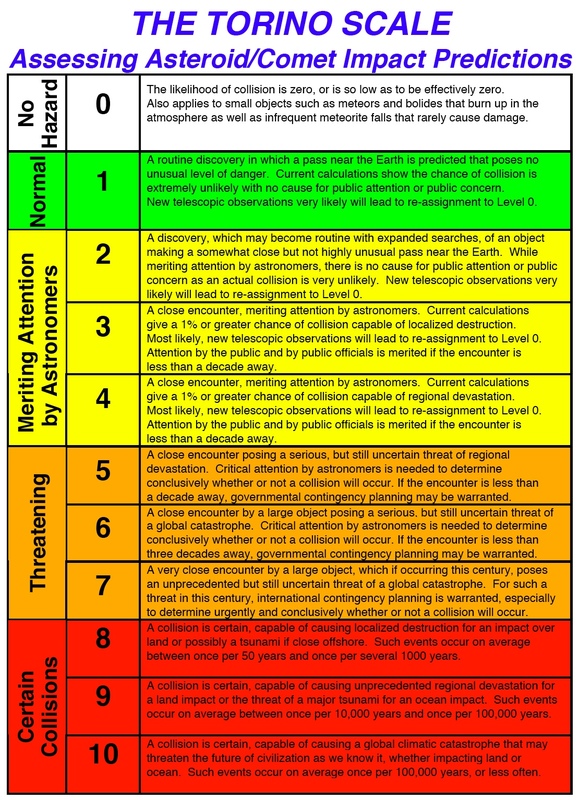 The ISSF and IAASS will in future months and years be trying to raise public understanding through advancing wider knowledge of the Torino Scale. Next time we will address what are the threats we face from PHAs. Stay tuned for the next article in this series: Clarifying Near Term Risk.